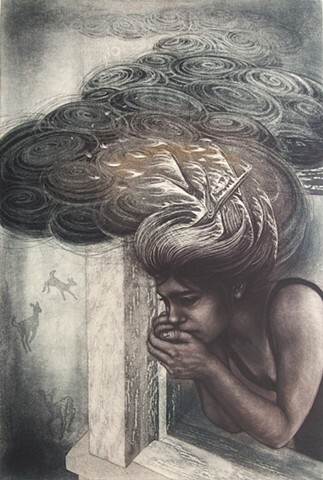 Carrie Lingscheit’s original intaglio prints exploit the subtleties of etching and mezzotint technique to explore themes of human behavior, interaction and the malleable nature of remembrance, presenting equivocal narratives that are often characterized by omission, distortion, and hyperbole. Her work has been included in numerous national and international exhibitions and in dozens of invitational exchange portfolios. Recent exhibitions include the 2018 Delta National Small Prints Exhibition, the 3rd International Mezzotint Festival in Ekaterinburg, Russia; and the 2017 Washington Printmakers National Small Works Juried Exhibition in Washington DC. Lingscheit holds a BFA from The University of South Dakota (2006) and MFA from Ohio University (2010.) She currently lives in Urbana, IL. More information about intaglio printmaking and etching processes can be found here, and an excellent overview of the mezzotint process is available here.